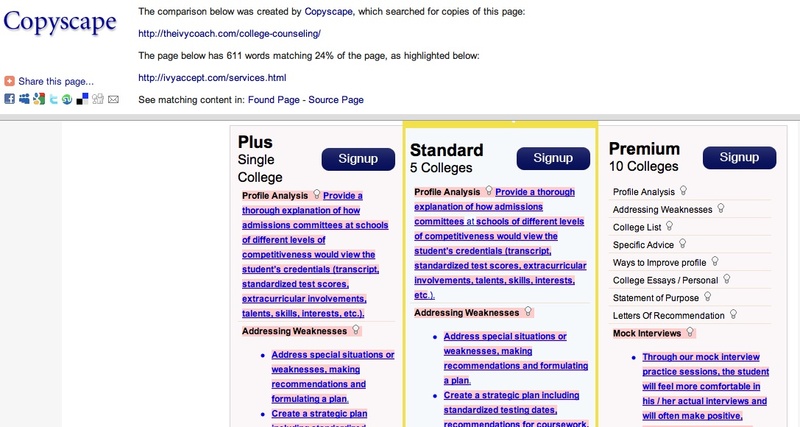 As you likely know from reading our daily blog, we create more content on the topic of highly selective college admissions than you’ll find anywhere. We work hard to create this original content and we’re mighty proud to do so. As such, we have zero tolerance and absolutely no sympathy no matter the sob story they try to feed us (“my webmaster did it without my knowledge” — uh huh) for folks and companies who plagiarize our copyrighted, original content. After all, did these people — who profess to be educators — really think they could get away with this violation of U.S. law (Title 17 of the U.S. Code to be precise)? It’s so easy to catch a plagiarizer. All you’ve got to do is scan the pages of your website through a service like “Copyscape” and the culprits pop up. We always contact the plagiarizers upon learning of their offense. We almost always hear back and resolve the matter to our satisfaction. Today, we are calling out a company that has extensively plagiarized verbatim our original content, ignored our communications that began in August of 2013, and thus refused — in defiance of international law — to remove our work from their website. Amit Gupta, director of “Ivy Accept” in India and Kuber Sharma, CEO of “Ivy Accept,” shame, shame, shame on you. You and your company, “Ivy Accept”, have plagiarized pages and pages of our content, which — unfortunately for you — is copyrighted with the United States Copyright Office. This copyright applies worldwide. We retain screen grab after screen grab, dated PDF after dated PDF of your infringement. We’ve included one such screen grab as an image for this post below. Shame on you, Amit Gupta. We’re guessing the folks at Wharton aren’t too proud of their graduate right now! And shame on you, Kuber Sharma. We’re guessing the folks at Columbia Business School aren’t too proud of you right now either. We suggest you get back to us at once, Mr. Gupta and Mr. Sharma. And to all other plagiarizers now and in the future, be warned that we at Ivy Coach have a zero tolerance policy for plagiarism and enforce our copyright as the law provides. It’s how we protect our American business — our entrepreneurial success story — from those who copy our work to achieve unjust enrichment. Below is one such screen grab of our copyrighted content that remains up on “Ivy Accept’s” website without our permission. The highlighted blue text is ours, plagiarized verbatim. As “Copyscape” notes, 611 words match 24% of our own services page. And this is one of several screen grabs we have! Here is but a sampling of “Ivy Accept’s” plagiarism of our copyrighted original content. The highlighted blue text indicates verbatim plagiarism of our own content. Shame, shame, shame on you Amit Gupta and Kuber Sharma.